We find that the best RV camping sites are almost always on public lands, and our featured RV camping sites are no exception. Learn about the area, photos of the campsite, campsite access and included RV camping location maps. These camping areas are usually a little or a lot off the beaten path, but we enjoy peaceful, scenic locations, and want to share them with you. The USA RV Camping Map has links to each individual states public lands administrators website. It's the easiest way to find RV camping resources for every state. One of the least visited national parks, Great Basin is off the beaten path with great scenery, Lehman Caves, and designated dispersed RV camping sites with fabulous scenery. The Wayne E. Kirch Wildlife Management Area (WMA) is home to the Dave Deacon developed campground. This free campground is well off the beaten path, but offers ammenities such as picnic tables with table shelters, fire grills, vault toilets, water, and even an RV dump station. Located in southwest Nebraska, you might not think of Cambridge as being an RV camping destination, but golfers should consider this town, and ourdoor recreation opportunities along the Republican River and the nearby Medicine Creek State Recreation Area make Cambridge a great RV camping destination. Thousands of RVers make Quartzsite their destination every winter. A great climate, wonderful scenery, historical areas, flea markets, a gem and mineral show, and much more are waiting for you. January and February are the most popular months for RV camping as this is when most events are scheduled, but late Fall and early Spring are much quieter for those wanting to avoid crowds. The Buffalo Gap National Grassland offers a wide range of recreation opportunities near Badlands National Park. 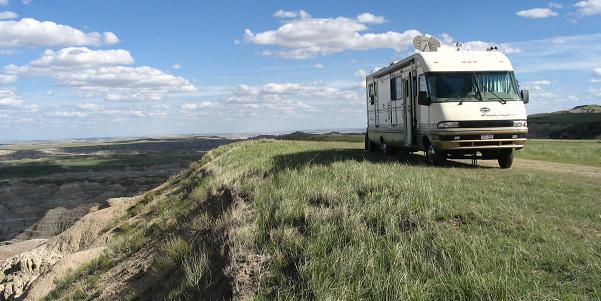 Camping along "The Wall" offers unspoiled views of the Badlands and surrounding prairie. Known as the birthplace of Paleontology (the study of fossils), old, and not so old history awaits you. Fall is nearly upon us, and some great RV camping opportunities open up for those looking for off peak season campground locations. The Kulshan campground is a great example. Though this campground has fee camping during the peak summer months, off season campers are treated to free campsites suitable for any size RV. This campground with the Cascade Mountains for a backdrop is maintained by Puget Power. RV travelers in southeastern Utah may find the camping is great just outside the small town of Bluff. Located in the San Juan River valley, this campground is an oasis of the southwest canyon country. Hiking, biking, back country exploring, birdwatching and rockhounding are only some of the outdoor actvities available. Campsite photos included. 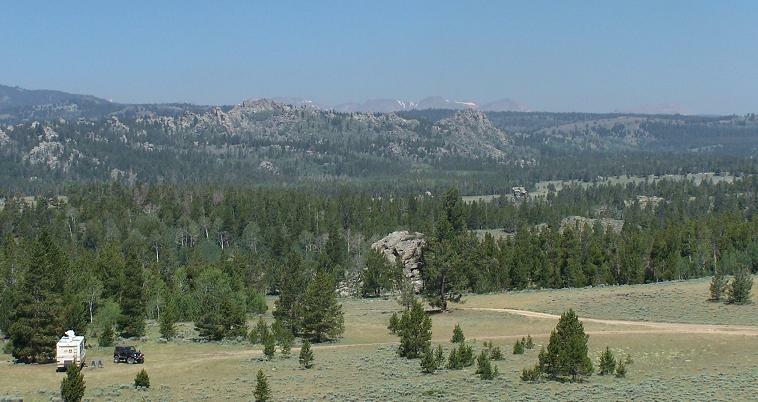 The Wind River Mountains of Wyoming southwest of Lander offer a wide range of outdoor recreation opportunities including dispersed RV camping (boondocking). This month, find out about access roads, wildlife, and what to expect at this exceptional free RV camping location. Campsite photos included. Wonderful scenery, a remote location free RV camping awaits you in southeastern Colorado. This area is home to a wide variety of wildlife, 270 types of birds, and visible history going back to the days of the dinosaurs. Picketwire Canyon is the location of North Americas largest dinosaur track site, petroglyphs, abandoned homesteads, modern ranch lands, and is only a few miles from this recommended RV camping location.